Possibly Capponi collection, Florence. (Count Alessandro Contini-Bonacossi, Florence); sold 1937 to the Samuel H. Kress Foundation, New York; gift 1939 to NGA. According to the Kress records in NGA curatorial files. Dutch and Italian Masterpieces from the Samuel H. Kress Collection, Dayton Art Institute, 1939-1940, no cat., as by Pontormo. Masterworks of Five Centuries, Golden Gate International Exposition, San Francisco, 1939, no. 47, repro., as by Pontormo. Masterpieces of Art. European & American Paintings 1500-1900, New York World's Fair, 1940, no. 12, repro., as Holy Family with Sts. Joseph, Ann, and the Young Saint John by Pontormo. Bronzino. Artist and Poet at the Court of the Medici., Palazzo Strozzi, Florence, 2010-2011, no. I.2, repro. Preliminary Catalogue of Paintings and Sculpture. National Gallery of Art, Washington, 1941: 158-159, no. 480, as by Pontormo. Book of Illustrations. National Gallery of Art, Washington, 1942: 249, repro. 171, as by Pontormo. Frankfurter, Alfred M. The Kress Collection in the National Gallery. New York, 1944: 41, repro., as by Pontormo. Paintings and Sculpture from the Kress Collection. National Gallery of Art, Washington, 1945 (reprinted 1947, 1949): 120, repro., as by Pontormo. Einstein, Lewis. Looking at Italian Pictures in the National Gallery of Art. Washington, 1951: 66-70, repro. 71, as by Pontormo. Paintings and Sculpture from the Samuel H. Kress Collection. National Gallery of Art, Washington, 1959: 108, repro., as by Pontormo. Walker, John. National Gallery of Art, Washington, D.C. New York, 1963 (reprinted 1964 in French, German, and Spanish): 307, repro., as by Pontormo. Summary Catalogue of European Paintings and Sculpture. National Gallery of Art, Washington, 1965: 104, as by Pontormo. European Paintings and Sculpture, Illustrations. National Gallery of Art, Washington, 1968: 92, repro., as by Pontormo. Shapley, Fern Rusk. Paintings from the Samuel H. Kress Collection: Italian Schools, XVI-XVIII Century. London, 1973: 10-11, fig. 20. European Paintings: An Illustrated Summary Catalogue. National Gallery of Art, Washington, 1975: 272, repro., as by Pontormo. Shapley, Fern Rusk. Catalogue of the Italian Paintings. 2 vols. National Gallery of Art, Washington, 1979: I:374-376, II:pl. 271. Walker, John. National Gallery of Art, Washington. Rev. ed. New York, 1984: 187, no. 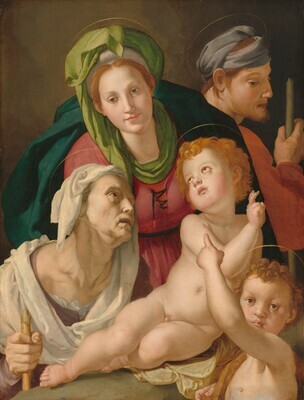 208, color repro., as by Pontormo. European Paintings: An Illustrated Catalogue. National Gallery of Art, Washington, 1985: 316, repro., as by Pontormo. Hand, John Oliver. National Gallery of Art: Master Paintings from the Collection. Washington and New York, 2004: 82, no. 59, color repro.